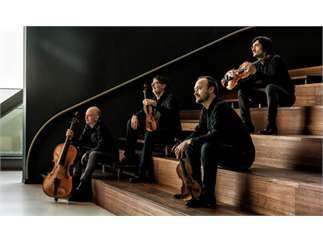 The Quatuor Danel has been at the forefront of the European music scene since its founding in 1991, with major concert performances worldwide including Paris, London, and San Francisco. They have also been recognized for a number of groundbreaking recordings, including their recently reissued recording of the complete cycle of string quartets by Russian composer Shostakovich, considered one of the benchmark interpretations of [the quartets]. The Quartet made its American debut during the 2015-16 season, featuring concerts at New York's Frick Collection and the Clarice Smith in College Park, MD, as well as at concert series across the country. The ensemble is famous for its bold, concentrated interpretations of the string quartet cycles of Haydn, Beethoven, Schubert, Shostakovich, and Weinberg. Their lively and fresh vision of traditional quartet repertoire has won them lavish praise from both the public and the press.